I spotted the story in the Daily Mail today about Foxtons trying to flog a tiny one bedroom flat in South East London for £450,000. Given the level of demand, the continuing low interest rates and ease of borrowing for the wealthy, plus the number of overseas contacts I know wanting to put money into London property, in the same way people store value in gold, then I won’t be surprised if they sell it for that, if not more. The flat happens to be on the street I used to live on in South East London a few years ago. 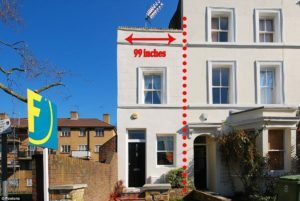 Not only is the property a tiny, poxy one bedroom flat, but it is in a pretty soulless part of South East London, in zone 3, next to a block of council flats and on the borders of Camberwell and Peckham, an area with a pretty high local crime rate. The average income in London is meant to be about £28,000. So just a one bedroom flat in a dodgy part of South East London is now 16x annual income. No doubt the bankers and their politicians will continue to keep interest rates low and restrict new building so as to protect the value of ‘their’ assets (when all they do is add a few digits to their balance sheets whenever someone agrees to sign up to one of their debt obligations). At the same time everyone trying to earn a living in the real world, attempting to build capital themselves, will get poorer and poorer as the value of their savings will be inflated away. As for me, this has definitely cemented my decision to move long term to another part of the world where property prices are not so wildly unaffordable and where the financial system is not so out of control.